AUSTIN, Texas - A federal judge on Thursday likened Texas' tough voter ID law to a poll tax meant to suppress minority voters and blocked Texas from enforcing it just weeks ahead of next month's election, knocking down a measure the U.S. Justice Department condemned in court as deliberately discriminatory. The ruling by U.S. District Judge Nelva Gonzales Ramos of Corpus Christi is a defeat for Republican-backed photo ID measures that have swept the U.S. in recent years and have mostly been upheld in court. And it wasn't the only one. The U.S. Supreme Court also blocked Wisconsin from implementing a law requiring voters to present photo IDs. Joe Biden: Voter ID laws aim to "repress minority turnout"
Gonzales Ramos, an appointee of President Barack Obama, never signaled during a two-week trial in September that she intended to rule on the Texas law - rebuked as the toughest of its kind in the U.S. - before Election Day. But the timing could spare an estimated 13.6 million registered Texas voters from needing one of seven kinds of photos identification to cast a ballot. Gonzales Ramos' ruling says the law "creates an unconstitutional burden on the right to vote, has an impermissible discriminatory effect against Hispanics and African-Americans, and was imposed with an unconstitutional discriminatory purpose." It added that the measure: "constitutes an unconstitutional poll tax." Republican Texas Attorney General Greg Abbott's office said it would appeal. "The State of Texas will immediately appeal and will urge the Fifth Circuit to resolve this matter quickly to avoid voter confusion in the upcoming election," said Lauren Bean, a spokeswoman for Abbott's office. Early voting is scheduled to begin Monday, Oct. 20. "We are extremely heartened by the court's decision, which affirms our position that the Texas voter identification law unfairly and unnecessarily restricts access to the franchise," Holder said in a statement released Thursday night. "Even after the Voting Rights Act was seriously eroded last year, we vowed to continue enforcing the remaining portions of that statute as aggressively as possible. This ruling is an important vindication of those efforts." Sherrilyn Ifill, president and director-counsel of the NAACP Legal Defense and Educational Fund, said, "The Court today effectively ruled that racial discrimination simply cannot spread to the ballot box." 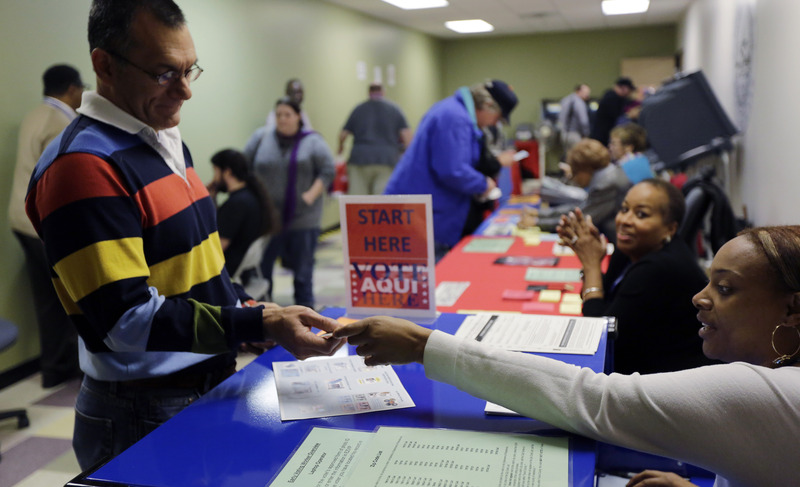 Nineteen states have laws requiring voters to show identification at the polls. Courts across the country have knocked down challenges - including at the U.S. Supreme Court - but the Texas case attracted unusual attention from Holder. He brought the weight of his office into Texas after the Supreme Court last year struck down the heart of the Voting Rights Act, which had prohibited the state from enacting its voter ID law signed by Republican Gov. Rick Perry in 2011. Democrats and minority rights groups joined the Justice Department in the lawsuit. The full Voting Rights Act had blocked Texas and eight other states with histories of discrimination from changing election laws without permission from the DOJ or a federal court. Holder vowed to wring whatever protections he could from the new and weakened version, and made Texas a first target. But prevailing in court required proving intentional discrimination, and Texas maintained that opponents produced no evidence. Abbott is favored to win the race to replace Perry as governor. His office said minorities and whites alike supported the law in public opinion polls. It also pointed to other states, such as Georgia and Indiana, where the similar measures have been upheld. But opponents slammed Texas' law as far more discriminatory. College students IDs aren't accepted by poll workers, but concealed handgun licenses are. Free voting IDs offered by the state require a birth certificate that costs little as $3, but the Justice Department argued that traveling to get those documents imposes an outsize burden on poor minorities. As a result, opponents say, Texas has issued fewer than 300 free voter IDs since the law took effect. Georgia, meanwhile, has issued 2,200 voter IDs under a similar program with more robust outreach. Texas has already conducted two smaller statewide elections under voter ID, in which no widespread issues were reported.